For what are you in the mood? Every so often, you need to get fancy. As in: fancy = your highest heels + your reddest lipstick + the expensive bottle of wine you’ve been saving. Or, when you’re gestating a human, and you want to put on your best lined slippers and your size-up yoga pants…the good news is you can still cook with really fancy ingredients, to make up for the wine you’re missing. I’m talking those things you bought when you went to the specialty kitchen store or spice bazaar and your husband was like, seriously? Do we even have room in the cabinets? When are we going to use these things? And you give him a look that says: this is already done. You know what I’m talking about. Saffron, fennel seeds, calasparra rice, all in one dish. You can even wear red lipstick. other vegetables as you please: grape tomatoes, scallions, spinach, etc. Heat a large saute pan over medium heat. Add a bit of olive oil and then onions + peppers and cook until softened, about 8 minutes. While these cook, pour the veggie stock into a bowl with the saffron and allow that tasty goodness to infuse the broth. Add garlic and fennel seeds to the pan, saute for another few minutes, or until onions begin to brown. Turn the heat up and then add a bit more olive oil, add the rice and cook for a few minutes. Pour in the sherry or wine and cook until the liquid mostly evaporates. Add salt, pepper, parsley, and smoked paprika – stir and cook for a minute or two. Pour in the stock, turn down the heat to medium again and leave your paella alone. No really. No stirring. Let the rice cook in that beautiful stock until there is just a tiny bit of liquid bubbling on top – about 10-15 minutes. Add the artichokes and/or other vegetables into the top of the rice and push them down (again, taking care not to stir the rice). Cook another 5-10 minutes, then turn off the heat and cover the whole thing, in order to let all the liquid absorb. 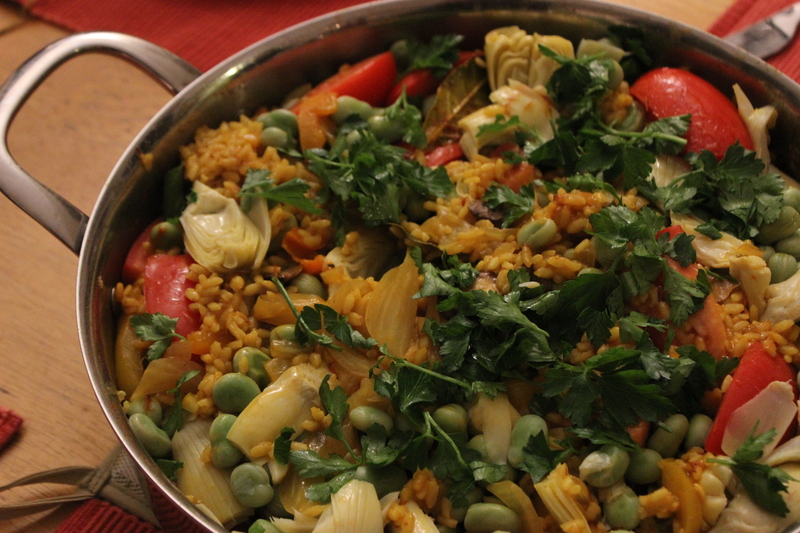 Just before serving, squeeze the juice from the lemon all over the paella and scatter with parsley. 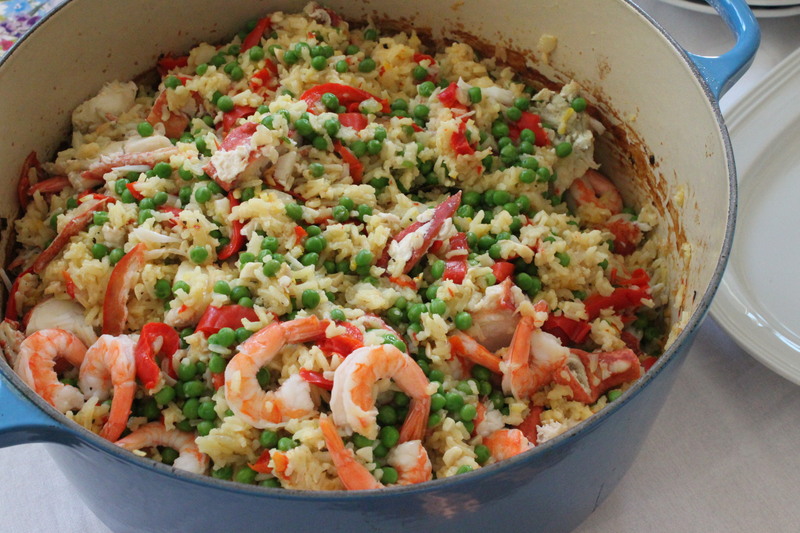 This paella gets even better on days 2 + 3 (which is a good news because this is a LOT for two people, even one person who counts as 1.5). Depending on your level of love for artichokes (mine is quite high) I might even suggest doubling up on those. Get really fancy. I love getting dressed up. I love drinking champagne. I love rocking out way too hard on the dance floor with the Husband. I love the many, multiple reasons to come home to Boston and see my friends. And I love going to bridal showers hosted by my mom. A little over a year ago, my mom called me in a panic. She’d offered to do the bridal shower for her BFF’s daughter, but now she didn’t know what that actually entailed. Food? Decor? Drinks? She was supposed to figure out GAMES!?! She asked me if it’d be appropriate to call in sick, citing European-ness. (According to my mom the German, Europeans just don’t DO showers.) She made her delicious Beef Bourgouignon, and needless to say, the shower was amazing. Agreed, Mom. Made all the more wonderful by this lobster paella. That’s right. Lobster paella. Heat olive oil in large, ovenproof Dutch oven. Add onions and cook over medium-low heat for 5-6 minutes. Add bell peppers and cook an additional 5 minutes. Lower heat, add minced garlic and cook another minute. Stir in rice, chicken stock, saffron, red pepper flakes, salt and pepper and bring to a boil. Cover pot and place it in the oven. Cook in the oven for about 12 minutes, remove, stir rice gently, and return to the oven to bake uncovered for an additional 10 minutes (or until rice is fully cooked). Remove from oven and transfer back to the stove top. Add Ouzo or Pernod and cook over medium heat until the liquid is absorbed. Turn off the heat; add lobster, shrimp, kielbasa, and peas. Cover and allow to steam through, about 10 minutes, so all of the protein heats through. Sprinkle with lemon and/or parsley and serve hot. 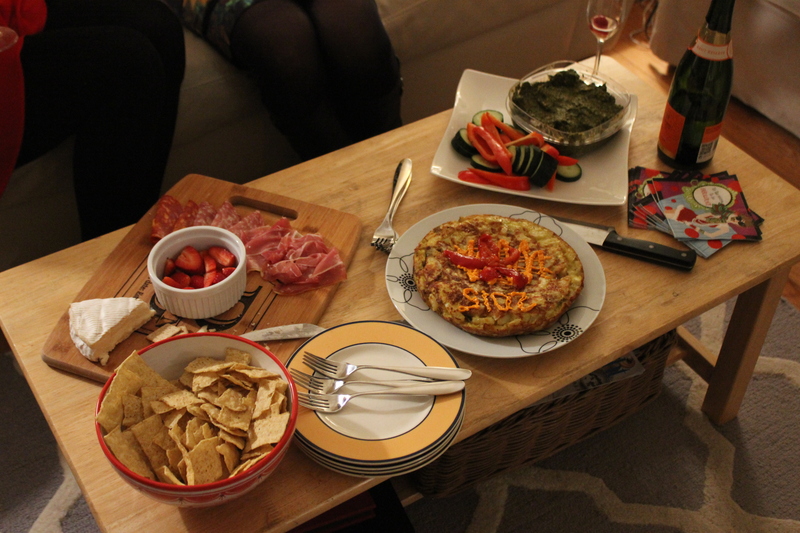 We had a very appropriately 30-something New Year’s Eve, replete with dinner guests, champagne, a charcuterie board, and of course, a game of vodka roulette (the Husband either won or lost, depending on your point of view. The next morning, he felt he had definitely lost). Totally approp. If you’re serving this as a dinner party dish and want to get the timing done right, best to get your veggies prepped first. Cut up your onion, peppers, fennel, etc. and set aside. The rest of the dish takes about 45 minutes start to finish. In a large skillet, heat the olive oil over medium heat. Add onions and saute about 6 minutes; add peppers and fennel and saute until they start to soften. Add garlic and mushrooms, cook an additional minute. Add bay leaf, turmeric, paprika, cayenne pepper and give the mixture a stir. Add the rice and stir it about for two minutes before adding the sherry and saffron. Let that cook off about a minute or so and then add your vegetable stock and a dash of salt (especially if you’re using low sodium broth!). Reduce heat to low and simmer, uncovered, for about 35 minutes or until the rice has absorbed the liquid. Don’t stir it. When the rice has cooked through, taste it without disturbing it too much and adjust the seasonings. Add the tomatoes and artichokes to the top and then cover for about 10 minutes, to give a chance for the heat to gently cook them. Serve with parsley and lemon wedges. 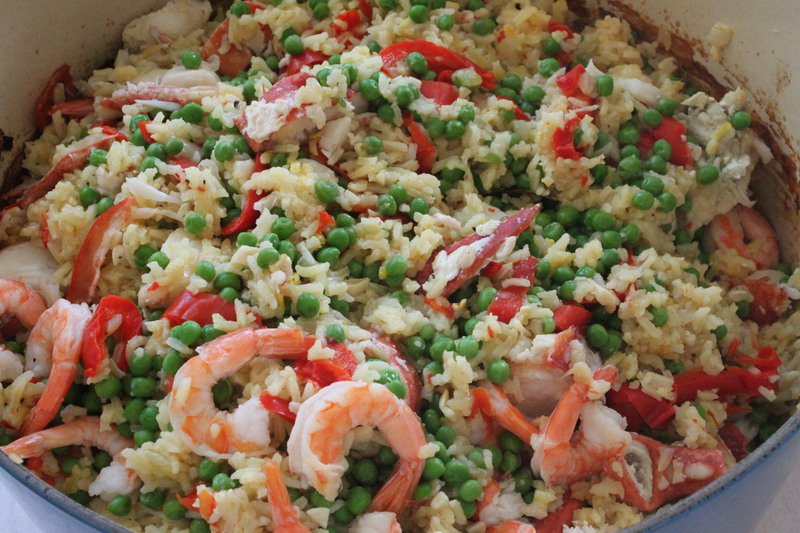 Fact: paella tastes better with seafood. That being said, this was very tasty rice with vegetables, and it had a pretty color, given the turmeric. No hay de que, por lo menos, ¡teníamos bastante cava!